The W.I. 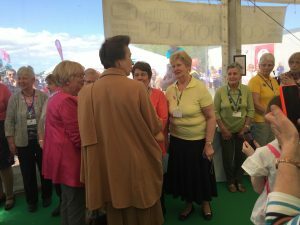 Ladies at Balmoral Show were delighted when HRH Princess Anne paid a visit to the W.I. tent on the Wednesday. The Federation Chairman, Colette; Treasurer, Pamela and sub-committee Chairmen were presented to her. She also spoke to some members dressed in costumes from the musicals and she appeared very interested in the floral art and baking competitions. She would have liked to see craft work but the minders ushered her out as she was already late. She did not appear to be in a hurry and took time to talk to W.I. ladies, as well as waiting crowd outside.